Note: This is the bound book only and does not include access to the Enhanced Pearson eText. To order the Enhanced Pearson eText packaged with a bound book, use ISBN 0134057252. How to do authentic classroom-based assessment, interpret the information, and use it to plan curriculum that is responsive to and supportive of children’s learning. This book is designed to help teachers conduct authentic, early childhood, classroom-based assessment, interpret the information that’s gathered, and ultimately use the information to plan responsive, supportive curriculum that ensures optimal learning for children, ages three to eight. 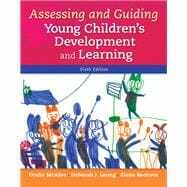 The authors include coverage of the teacher’s legal, ethical, and professional responsibilities in assessment; how to organize for summary assessment and formative assessment; how to understand standardized assessments; and how to communicate with parents. A special appendix helps teachers design assessments in all developmental domains and includes suggested behaviors to observe and charts to help teachers identify the next steps in learning and development. The Sixth Edition of Assessing and Guiding Young Children’s Development and Learning has been revised and updated to reflect the rapidly developing concepts of appropriate assessment, expected educational outcomes, the way young children develop and learn, how the authentic assessment process relates to the use of formal state-mandated assessments, and the early childhood teacher’s assessment responsibilities. The Enhanced Pearson eText features embedded video and assessments. Oralie McAfee is professor emerita of early childhood education at Metropolitan State University of Denver. She is the author of books, research papers, articles, curriculum and teacher-training materials, and other publications related to working with young children and their families in the classroom and home, and has presented on these topics throughout the United States. She has done research on assessment practices and needs in Head Start and in selected state-funded prekindergarten programs. She is author (with Deborah J. Leong and Elena Bodrova) of Basics of Assessment: A Primer for Early Childhood Educators (National Association for the Education of Young Children, 2004). Deborah J. Leong is a professor emerita of psychology at Metropolitan State University of Denver and co-founder and Executive Director of the Tools of the Mind Curriculum Project, a Vygotskian-based early childhood teacher-training program. She is also a research fellow at the National Institute for Early Education Research (NIEER). She is co-author with Dr.s McAfee and Bodrova of Basics of Assessment (National Association for the Education of Young Children, 2004). Dr. Leong is also co-author with Dr. Bodrova of Tools of the Mind: The Vygotskian Approach to Early Childhood Education (Merrill/Prentice Hall, 1996) and four educational videos (Davidson Films). She and Dr. Bodrova have written many articles on assessment, play, early literacy, and the development of self-regulation in young children. Elena Bodrova is a senior researcher at Mid-continent Research for Education and Learning (McREL) in Denver, Colorado. Prior to her coming to the United States, she was a senior researcher at the Russian Center for Educational Innovations and the Russian Institute for Preschool Education. She received her Ph.D. from the Academy of Pedagogical Sciences, Moscow, Russia, and her M.A. from Moscow State University. In addition to her work with Dr. Leong, she co-authored the book, For the Love of Words: Vocabulary Instruction That Works, Grades K-6 (Jossey-Bass) with Diane E. Paynter and Jane K. Doty.